This example shows the 2 Circle Venn Diagram. The Venn Diagrams visualize all possible logical intersections between several sets. 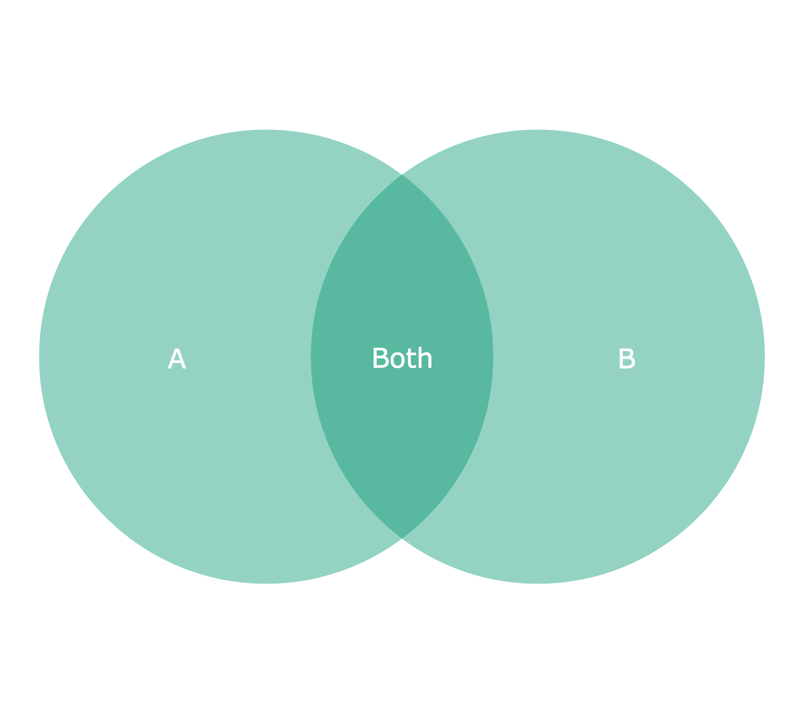 On this example you can see the intersections of 2 sets A and B. Venn Diagrams are widely used in mathematics, logic, statistics, marketing, sociology, etc. Example 1. 2 Circle Venn Diagram. The Circle Diagrams are the diagrams which represent the central element surrounded by other items in a circle. This type of diagram is very popular and widely used in marketing and management, for process modeling, market, resource, time and cost analysis, for visualization causes and effects. If you dream to design the Circle Diagrams quick and easy – the ConceptDraw DIAGRAM v12 software extended with Circle-Spoke Diagrams Solution from the "What is a Diagram" Area is exactly what you need. You need design Cylinder Venn Diagram? Nothing could be easier with ConceptDraw DIAGRAM v12 diagramming and vector drawing software extended with Venn Diagrams Solution from the “What is a Diagram” Area. ConceptDraw DIAGRAM v12 allows you to design various Venn Diagrams including Cylinder Venn Diagrams. Venn Diagrams visualize all possible logical relations between several sets and are widely used in mathematics, logic, statistics, marketing, sociology, etc. This Venn Diagram shows the relative complement of the set A with respect to the set B. It is the set of the elements in B, but not in A. In other words it is the set-theoretic difference B-A.